Imagine exploring London’s Brick Lane or climbing Budapest’s Gellert Hill when the clouds darken, the sky opens up, and it starts down pouring. If you’re not prepared, you’ll get soaked in a matter of seconds, ruining whatever plans you had for that day. So why not invest in a good quality travel umbrella to help you stay dry while you are out and exploring a new city? 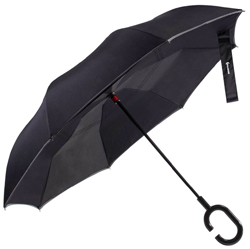 The best umbrellas for travel are durable, lightweight, compact. They can fit everywhere from your car door to your travel backpack, and you’ll hardly notice they’re there. Overall, the best travel umbrella on the market is the Repel Windproof Travel Umbrella. It’s made with high-quality materials and is quick-drying. While it is the best compact umbrella available, there are many other premium travel umbrellas on the market that may work better with your preferences. Our comprehensive guide will tell you exactly what to look for in order to choose the best small travel umbrella for you. 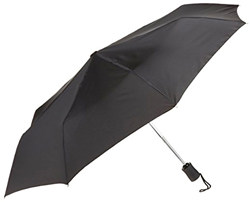 Below is a list of the best compact travel umbrellas. Click on the umbrella name to read reviews and check prices. Most umbrellas can protect you from light rain showers, but only a quality travel umbrella will protect you from strong winds and heavy rain. Traditionally, the best windproof umbrellas have been tested against winds up to 60 mph and will have a canopy diameter of at least 40 inches for optimal protection. One last convenience some people don’t think of is an automatic open and close feature. It allows you to open your umbrella with only one hand in a matter of moments should a sudden rain shower occur. Because it’s such a crucial feature, all of our recommended umbrellas have an automatic open and close button for your convenience. A lightweight travel umbrella is important because you don’t want to be weighed down on your adventures. While most travel umbrellas weigh around one pound, some of the best mini travel umbrellas weigh closer to a half of a pound. Not only are they super light, but most only measure about 12 inches in length. They’re the perfect size to fit in your purse, carry-on luggage, or the side pocket of your backpack without taking up too much space. All of our recommended travel umbrellas are lightweight and easy to carry. Like anything else you buy, quality is super important. Even though they’re small, the best compact travel umbrellas will be made with premium materials like fiberglass, aluminum, or steel. Some umbrellas are even introducing a Teflon coating to aid in waterproofing. A good travel umbrella should go with you for many years through many countries, and several of our recommended umbrella companies are so confident in the quality of their products that they even offer lifetime warranties. Nothing will defend you from the elements like the top-of-the-line Repel Windproof Travel Umbrella, and that’s why it’s overall the best travel umbrella available. It’s less than one-foot long and weighs less than a pound, making it easy to store in your carry-on or even in a purse or briefcase. 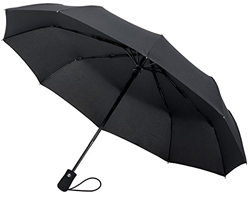 You can quickly open and close the umbrella automatically with the press of a button, making it an ideal choice in the event of a sudden rain shower. Even better, after the rain stops, the superior Teflon material dries instantly. Repel is so confident in their product that there’s a lifetime guarantee included. With everything it has to offer, there’s no wonder why the Repel Windproof Travel Umbrella is the best umbrella for travel. We’ve all seen someone’s poor umbrella fall victim to the wind and get blown inside out, but EEZ-Y has made sure that will never happen to you. 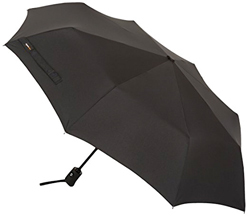 The EEZ-Y Compact Travel Umbrella has a vented double canopy that secures its spot among the best windproof umbrellas. The vents in the canopy allow the wind to blow through the umbrella without inverting it, all while keeping you dry. It folds up to 11 inches and packs easily wherever you need it to be. The EEZ-Y Compact Travel Umbrella with Windproof Double Canopy Construction is truly designed to last as its innovate frame system promises no breaking or rust. Should something happen to your beloved umbrella, there’s a lifetime replacement guarantee. Even though it’s a small travel umbrella, once you try out the EEZ-Y Compact Travel Umbrella, you’ll be absolutely sold. Rain-Mate has set out to create the best wind-resistant umbrella on the market, and its excellence speaks for itself. Its nine reinforced fiberglass ribs ensure you can walk with confidence no matter how strong the wind. It’s lightweight, compact, and built with high-quality materials. The large canopy opens to an impressive 42 inches to keep you dry even when the wind and rain are raging. 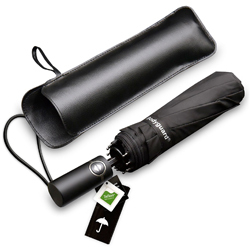 Once the rain stops, close it automatically with the push of a button and slide it into the travel sleeve. Collapsing to only 12 inches, it’s the perfect size no matter where you’re headed. It’s backed by great travel umbrella reviews and a lifetime replacement guarantee, so the only thing you have left to do is pick the color you love the most. Whether you’re battling the crowds to see the best of Rome or you need a solid backpacking umbrella, this super lightweight travel umbrella is perfect for any occasion. It only weighs 10 ounces, but its sturdy design and water-resistant material are designed to protect you through all types of weather. The storage sleeve is mold-resistant and has a carry loop, so if you’re camping in Big Sur or backpacking through Guatemala and don’t have time to let it dry out, you won’t have to worry about it collecting mold and damaging your bag. It automatically opens and closes so you can keep one hand free for things like your suitcase or your camera. When looking for the best portable umbrella, for the quality and price the Lewis N. Clark Lightweight Travel Umbrella can’t be beat. 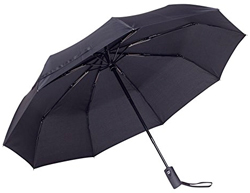 AmazonBasics has managed to create a true gem that skyrocketed its way to the top of the list of the best compact umbrellas. 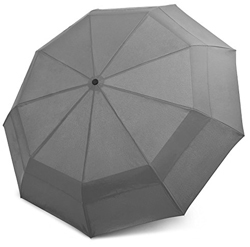 High-quality materials set the foundation for this amazing umbrella, and it even has the option for a wind vent for added protection. Only 11 inches when closed, it’s very compact and easy to take with you around the world or down the street. Its secure-grip handle, automatic open and close button, and storage sleeve are just a few other conveniences you’re sure to love. Crown Coast Travel Umbrella has been named the best compact travel umbrella because of its size and ability to withstand 60 mph winds. It has been tested in a full-size wind tunnel, and its Flex Memory technology ensures that if the wind does invert it, it will bounce right back to normal without you having to do anything. The compact carrying case makes it simple to toss in your car, your luggage, or your travel stroller, and you’ll only notice it if you need it. It’s very light and comes in lots of fun colors and designs, making it perfect for kids and adults alike. This company truly puts their customers first and are so confident in the quality of their product that they offer a 100-day zero risk money back guarantee. For a premium umbrella from a quality company, get the Crown Coast Travel Umbrella today. The Bodyguard Travel Umbrella is an excellent umbrella with a high-end look without the high-end cost. While some umbrellas come with a cheap and flimsy-looking sleeve, you’ll look classy when people see you whip out this umbrella as it comes with a waterproof leather case. Thankfully, the case isn’t the only thing that makes it the best small travel umbrella. The state-of-the-art Teflon technology repels water and dries quickly. Open it automatically with the press of a button, and with a canopy that’s more than 46 inches, it can keep two-three people dry at once. The ideal blend of durability, portability, and protection against the elements, you can’t go wrong with the Bodyguard Travel Umbrella. If you’re looking for the lightest travel umbrella available, make sure to take a look at the McConnor Travel Windproof Umbrella. 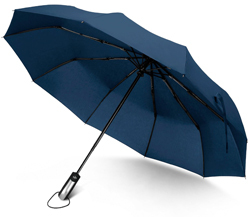 What makes this umbrella unique is that the lining is made from strong, high-density, silk-woven pongee, making it lighter, stronger, and slimmer than standard double-canopy models. From the heat-treated steel to the durable outer ribs, McConnor has done their research to ensure they provide a premium product. Its first-class performance is evident by its nearly perfect travel umbrella reviews, so be prepared to love yours and buy more for your family and friends. It has a simple look, but it’s packed with technology to keep you dry, and that’s why the McConnor Travel Windproof Umbrella is one of the best travel umbrellas available. Convenience and creativity have combined to create the Glamore Inverted Double Layer Travel Umbrella. With so many unique features, there’s no way it couldn’t make the list of the best umbrellas for travel. First of all, it’s hands-free, meaning you can take pictures, carry a baby, and more without getting wet. It also boasts an inventive reverse-folding design, so gone are the days of getting water splashed on you when you close your umbrella. The Glamore Inverted Double Layer Travel Umbrella even stands on its own, so it can dry itself out without you having to open it and turn it upside down like standard umbrellas. The double-layer waterproof and UV protection, along with the ventilation holes keep you protected through rain and shine. You don’t want to miss out on this brilliant umbrella. 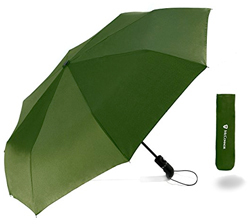 Rainlax prides itself on producing the best mini travel umbrella available. When a storm or downpour hits, you definitely want to have the Rainlax Travel Windproof Umbrella by your side as it can withstand winds up to 60 mph. The premium materials used in this umbrella mean you can travel with confidence knowing that your umbrella will keep you dry whether you’re hiking the Great Ocean Walk, exploring Jamaica, or just going to the grocery store. 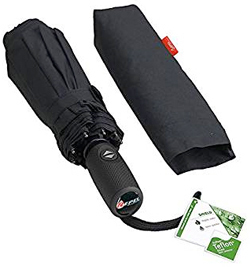 Like all of the umbrellas listed here, you can expect it to open and close automatically and come with a convenient carrying case perfect for any size bag. 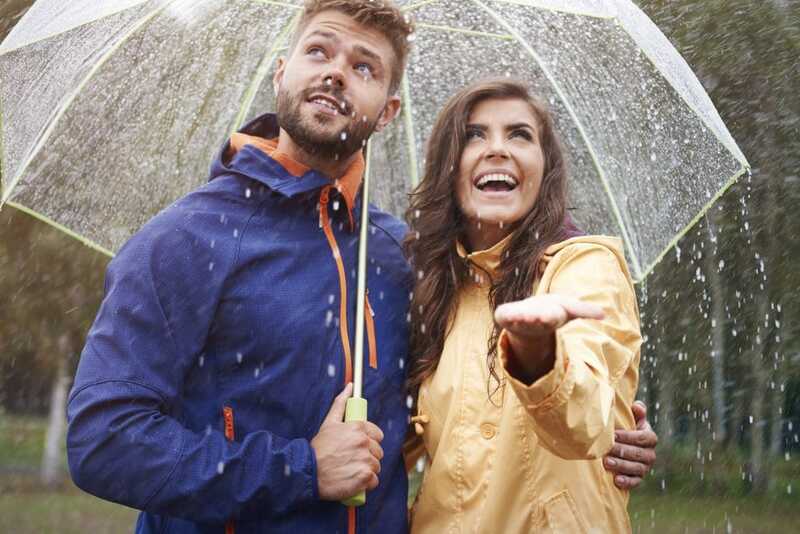 We know you’re likely to love and become attached to the Rainlax Travel Windproof Umbrella, and the great news is that if anything happens to it, there’s a lifetime replacement guarantee with no return required. So, whether you’re looking for the best hiking umbrella or just the best travel umbrella to keep you dry during the kids’ soccer practice, the Rainlax Travel Windproof Umbrella is an ideal option. Now that you know the best travel umbrellas on the market, you’ll always be prepared when the rain comes!